Each summer along Florida's beaches, numerous permitted volunteers and patrols scour the beaches early in the morning searching for sea turtle nests. When they find tracks coming from the water, they then determine if the turtle nested or just came out of the water and returned, a false crawl. If the turtle nested, the volunteers and patrols must record the GPS location, the date and the species (which is determined by the pattern of the tracks), as well as some other information. The nest is then marked off with stakes and yellow or pink tape. By marking the nest, beachgoers and beach rakers are made aware of the location of the nest and hopefully will not disturb it. Then, depending upon the species, about 45-55 days after the nest was laid, the eggs will hatch. Volunteers and patrols look for a sign that the nest will be hatching soon – a depression that begins to form in the sand as the eggs below hatch and the sand fills in the spaces. A few days after the nest hatches, the stakes and tape are removed and some nests are excavated, or dug up to calculate hatching success rate. In Broward County, Florida, this is all completed by Broward County's Sea Turtle Conservation Program (BCSTCP) and Nova Southeastern University's Oceanographic Center students. Each year they require electronic supplies, markers, tape, ATV maintenance, gasoline, backpacks, etc. in order to mark and protect each nest. The National Save the Sea Turtle Foundation helps to offset the cost of the materials needed through their Adopt-a-Nest program which donates half of all proceeds directly to the BCSTCP to protect the nests and 25-30% to other conservation programs. By adopting a nest for $40.00, you are assisting in the protection of a nest on the beach. You will be assigned a nest with your name, or group name, on the stake marking the nest. You will receive a picture of the nest, along with information on its location as well as the date laid. Upon hatching, you will receive pictures of hatchlings, and information on how many hatchlings your gift helped to support. 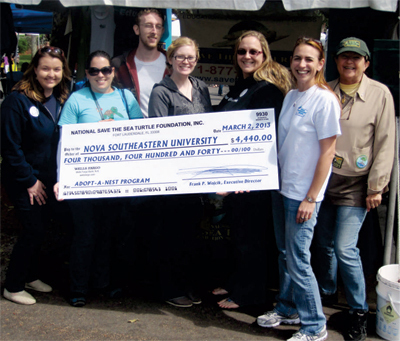 For the 2012 nesting season, the NSTSTF was able to donate $4,440.00. This year, there will be additional costs for the BCSTCP because, nesting numbers in Broward County are higher than they have been in previous years, about 400 nests more. If you are interested in adopting a nest, pleased visit www.theseaturtlestore.com.